I've been playing catch up, I finally found some extra time to get to some older photos scrapped. 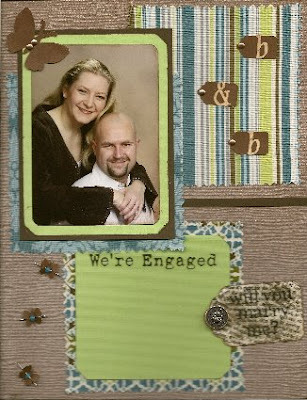 The top photo is of our engagement, and as for putting it together, I just let the photo inspire the layout. I kept it simple and I am really liking that, it makes it faster for one and also it keeps me motivated to do more. This next photo is one of our wedding photos, obviously, and although a bit revealing (sorry about that) - it is one of my favorite photos from our wedding. Bill & I call it our 'model' shot and well I'll leave that for you to decide. Again, as with the first layout, I let the photo inspire the layout design. I did have a vision for this particular photo and once I got my vision down, I just went with the rest. I think that's been my trouble in the past, I over think the process and make it too complicated. 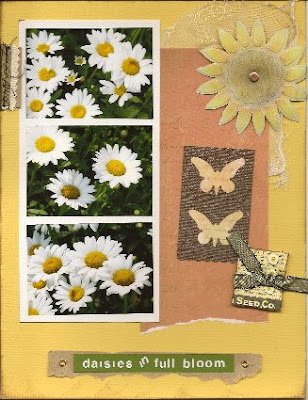 This final layout is of my favorite flower, the daisy. My mom took this picture for me one day while we were visiting so I had to put it in a layout. The cool thing with this layout is that I used some older stuff I had in my stash, bits & pieces that I put together a long time ago. It's really cool to me to see them actually being used now, I've got several more that I hope to find a home for soon. As for the process, these 3 layouts took me all of a day (maybe) and I am totally excited about that. Also I have found that I really like the 8 1/2 x 11 size, it is just more reasonable to me and not quite so overwhelming when I don't have a lot of photos to help fill up the space. 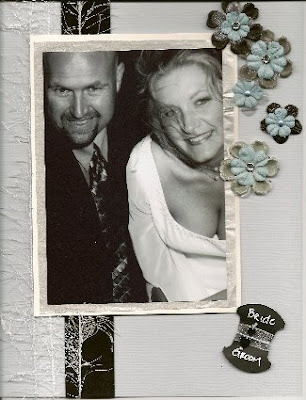 I admire scrappers who can use just one photo and still scrap it in a 12 x 12 layout and have it look great. I have tried that several times and it just ends up looking too cluttered to me or totally empty, so I tend to stick with grids and clean lines just because I know that does 'work' for me. Anyways, that's all I have for today but I intend to get some more done in the near future, so when I do I will get them posted for you.